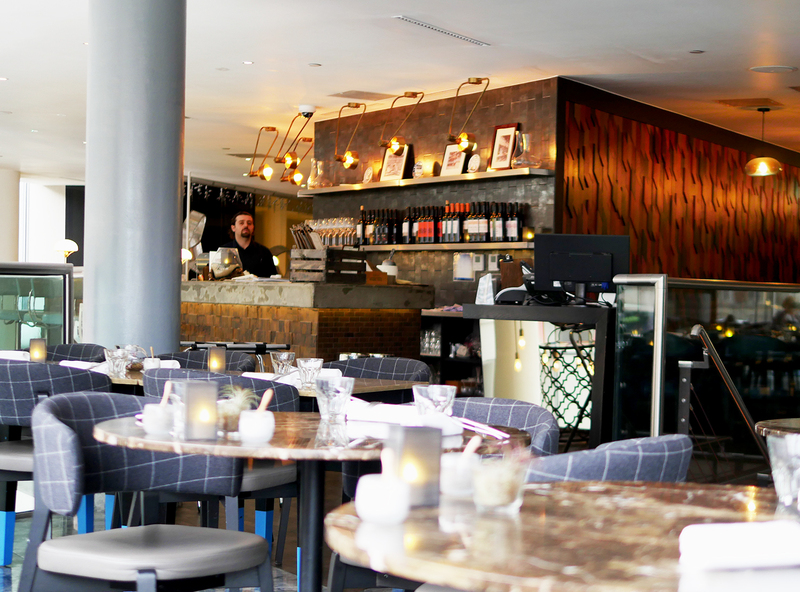 With a CV that sounds like a Michelin star in the making Owner and Chef Director Arnaud Stevens has previously worked with Pierre Koffmann, Gordon Ramsay, Jason Atherton and Richard Corrigan. 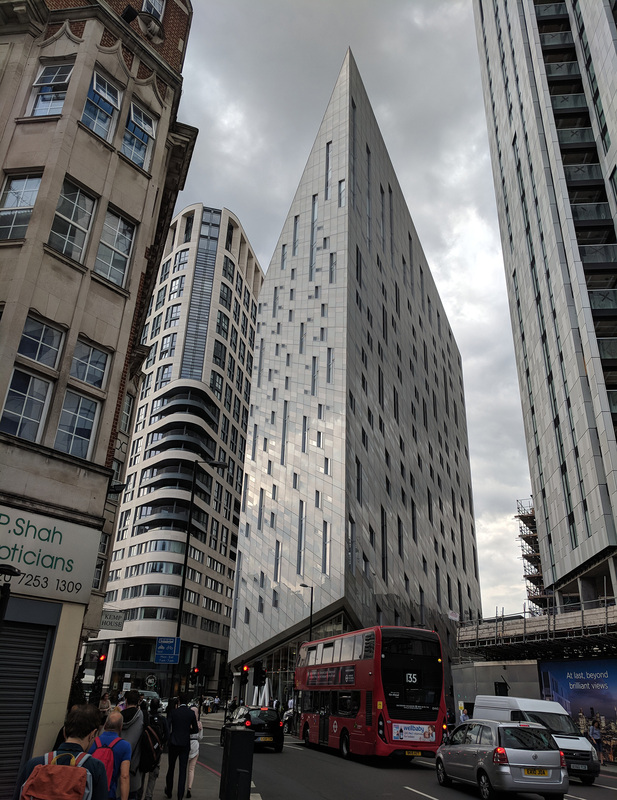 I was curious to explore his newly opened Plate restaurant, located on the first floor of M by Montcalm hotel in the heart of trendy Shoreditch where you are more likely to find a smokehouse than fine dining. The friendly bar staff downstairs pointed out how to reach Plate restaurant. Walking up the stairs past an old gramophone playing some 80s style pop, we were excited to see what was on offer. Upstairs the contemporary styling was perfectly in keeping with M by Montcalm. We sat at a table looking out over Old Street with the 80s style pop music from downstairs at times breaking through the hotel lobby style music playing in the restaurant. It’s something which needs a little attention – obviously, it may depend on where you sit in the restaurant but anywhere in front of the staircase has something of a music clash which spoils the ambience. The a la carte menu is brief but nicely structured, although I’d personally have liked a few more side dishes on offer. And, the staff in the open kitchen at the back of the restaurant are friendly and helpful. 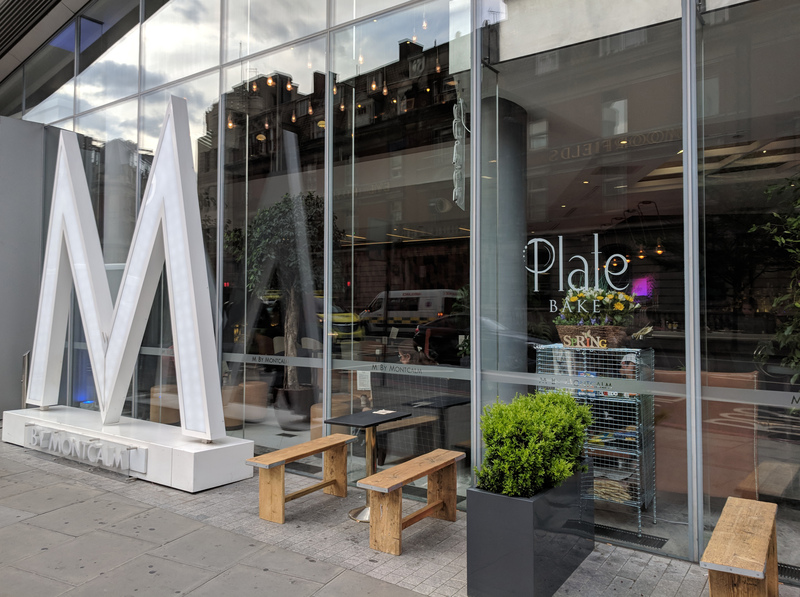 Plate aims to focus on beautiful food with accessible price points and certainly, the dishes here are well priced for any hotel in the area. What arrived at the table exceeded our expectations throughout too. 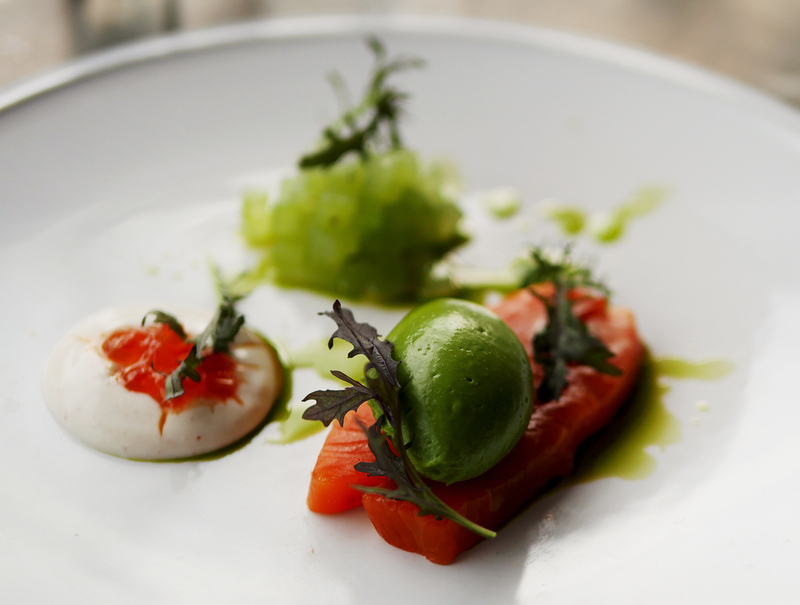 I loved my Chalk Farm seatrout with gravadlax dressing, pink peppercorn yoghurt and cucumber. The tiny morsels of cucumber not only looked pretty but also provided an excellent contrast in texture with the soft buttery seatrout while the pink peppercorn yoghurt added just the right amount of kick. My companion’s dish, however, despite not winning any beauty contests was definitely the winning dish for this round. 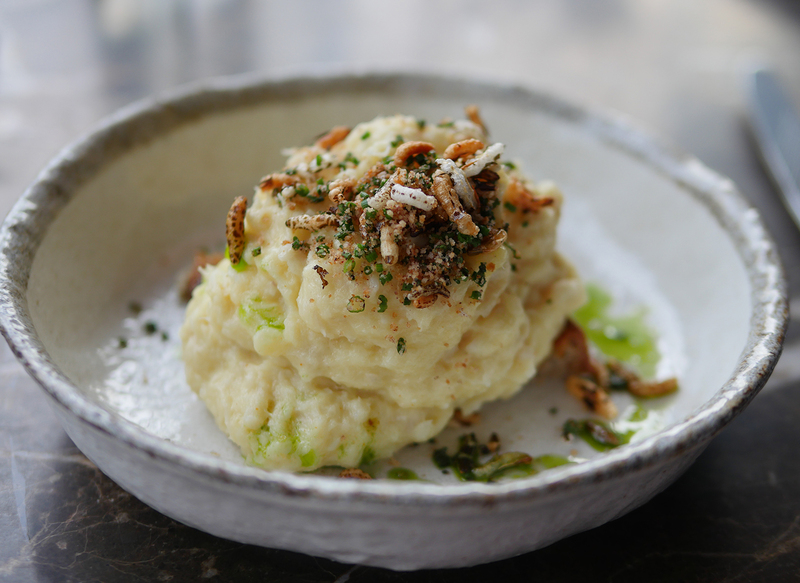 Brandade is a classic dish of salt cod, poached and served with mashed potato. Here it was piled on a round of sourdough over a slow-cooked egg, then topped with puffed wild rice. My companion loved the theatre of the dish, as you reach the heart of the dish, the yolk of the egg pours out in the brandade, while the sourdough provides great textural contrast. 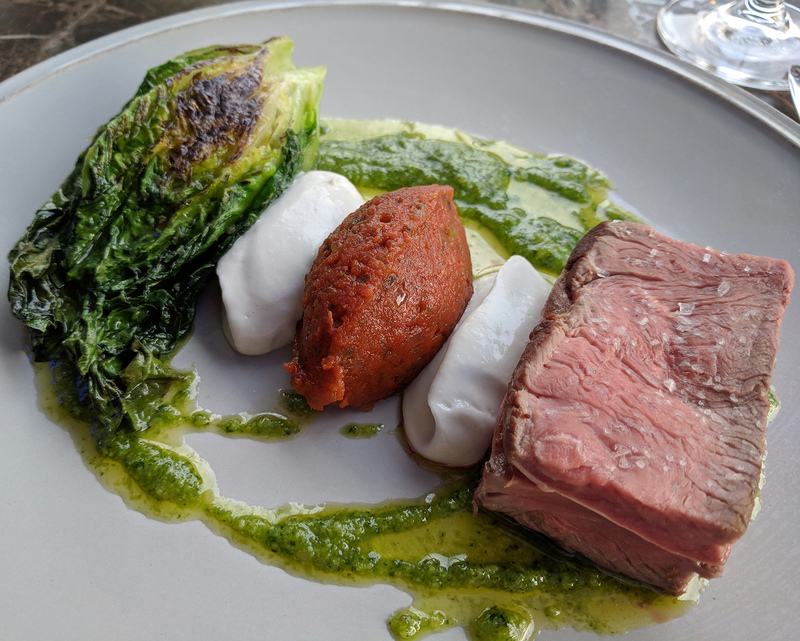 British Isle Lamb Rump with tomato fondue, anchovy, basil dressing and charred gem was my companion’s main course choice. The lamb was beautifully soft and cooked to perfection. My companion loved the soft sweet tomato fondue with anchovy and he polished off the entire dish together with a good helping of the Koffman cabbage with pancetta and celeriac and the Agata potato with creme fraiche, dill and chervil. 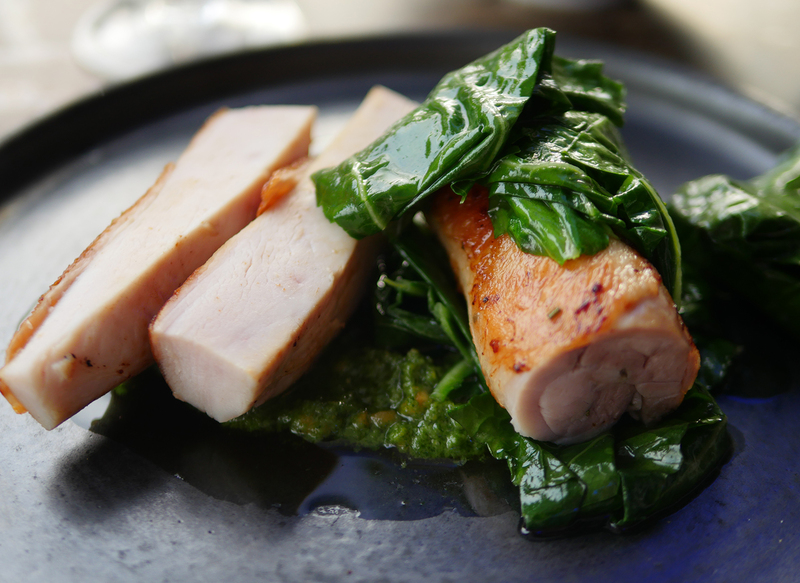 My own dish was Creedy Carver chicken breast and thigh with wild garlic pesto and spring green. 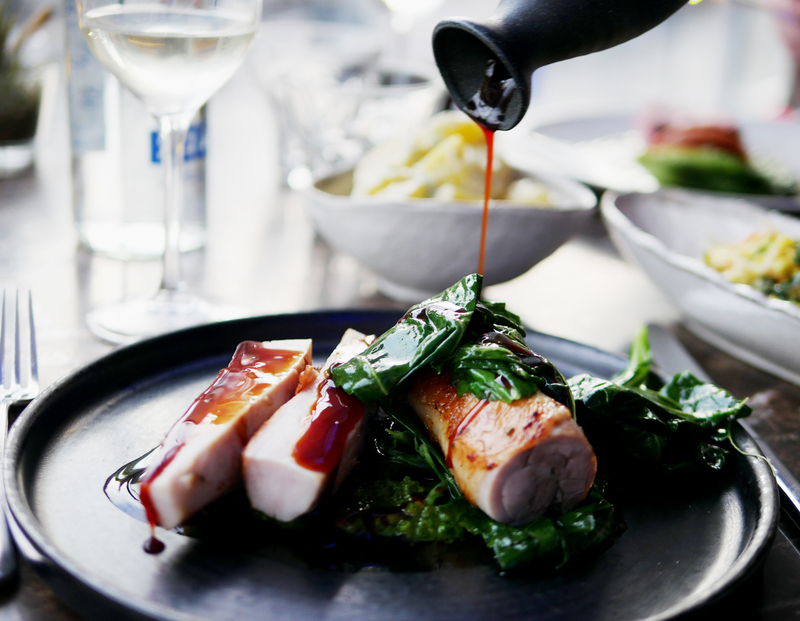 Deliciously tender chicken was topped with a rich jus. The rolled thigh was just a little overly salty, even for my taste but it didn’t spoil my overall enjoyment of the dish. I’d have preferred a simpler side dish option – perhaps some new potatoes for instance. While I enjoyed both our side orders, they seemed a little overcomplicated given the structured flavour palate of our main courses. For me a lovely honey and buttermilk pannacotta with rhubarb, ginger and raspberry anise sorbet. 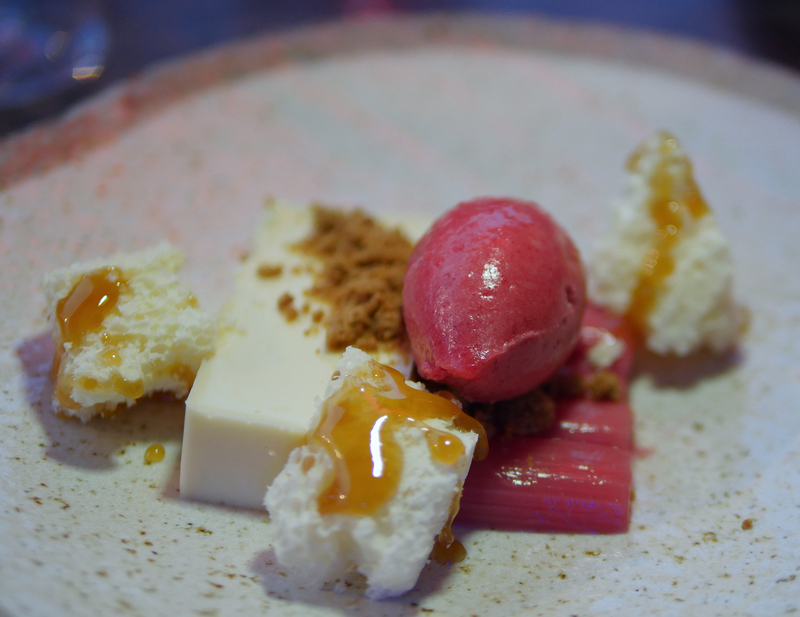 I really enjoyed the piquancy of the sorbet and rhubarb against the soft pillowy pannacotta. There’s a strong anise note to the sorbet which I loved and the little ginger crumbs just made for a delicious mixture. My companion indulged in a Valrhona Caramelia chocolate mouse with pain perdu, hazelnut and passion fruit. 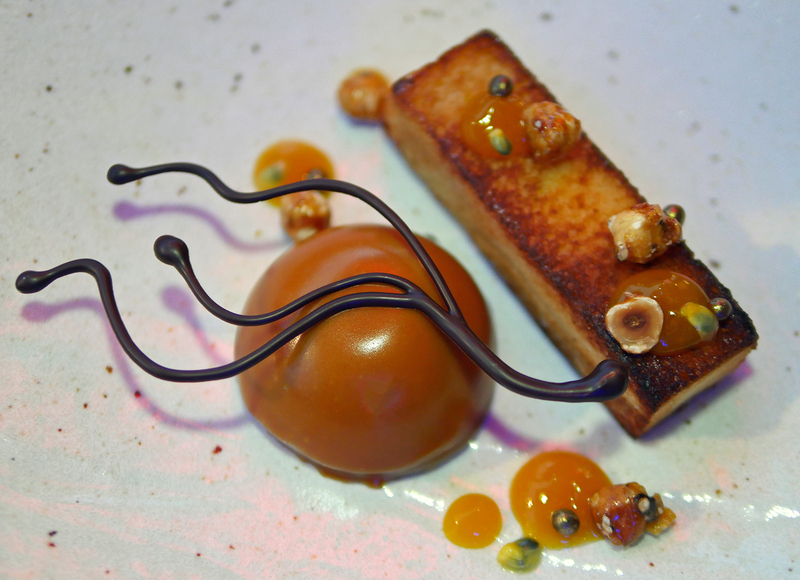 A stunning dessert, I was surprised that the caramel outer of the mousse was soft. And, I’d have ordered a bowl of the pain perdu by itself. Delicious. To sum up, this is a restaurant with a lot of promise. There are definitely a few teething problems and I’d have liked to see a few simpler options on the menu. The complex flavour combinations of the mains and side course were all beautiful, but sometimes you just want an easier mouthful.